A reporter from LA comes to town and is found strangled to death in a local motel. He'd been inquiring about a cold case: ten years ago, a boy was killed in the playground, but the murderer was never found. Amelia thinks if they can find the reporter's killer, they can finally catch the boy's killer. Between creating a new lemonade cupcake recipe and a savory chili cornbread muffin, Amelia acts on her instincts to finally solve the case. But will her bold actions put her, as well as her children, in danger? 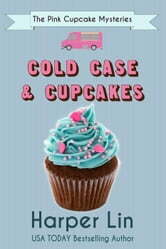 Find out in the 4th book (30,000 words) in The Pink Cupcake Mysteries. This is my favourite of the Cupcake series. Lots of twists and turns in this one, I really enjoyed it. Just when you think you have it figured out there's another twist! Another great Harper Lin read. I received a copy of this book from the author in exchange for my honest review. 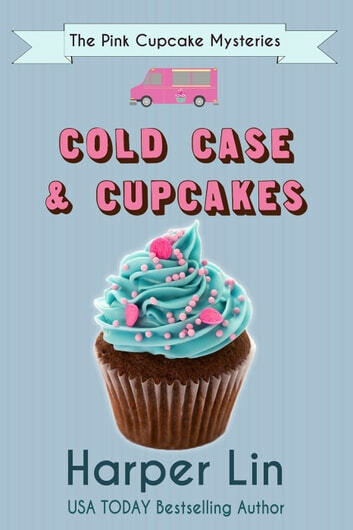 Another winner in this fun and unique series about cupcakes and murders! In this book, a reporter investigating a cold case into the death of a child, is found murdered in his hotel room. When Amelia hears about the case and begins to reminisce about her children at that age, she feels compelled to get involved. I enjoyed this story, especially how intense and suspenseful it became. I highly recommend this entire series and I look forward to the next book.